Yahoo Japan Corporation (the Company) and its consolidated subsidiaries and affiliates (the Yahoo Japan Group) consider good corporate governance to be essential to enhancing corporate value over the medium to long term. In clarifying the roles and responsibilities of directors, corporate officers, and employees within the corporate governance system, the Company aims to conduct appropriate and effective business operations. By maintaining appropriate corporate governance and conducting effective corporate activities, the Company intends to retain the trust and understanding of all stakeholders. Japan’s new corporate governance code, which took effect on June 1, 2015, establishes fundamental principles of good corporate governance, including transparent, fair, timely, and decisive decision-making as well as proactive management. Given that timely and decisive decision-making is a key governance principle among companies in the Internet industry, management believes that the Company’s basic stance on corporate governance is in broad alignment with that outlined in the new corporate governance code. Bearing in mind the intent of the new code, the Company converted to a company with an Audit and Supervisory Committee as its corporate governance structure after approval at the general shareholders meeting on June 18, 2015. In further compliance with the new corporate governance code, we also appointed two independent outside directors in order to ensure independent perspectives and to enhance transparent and fair decision- making. In addition, we have clearly separated the decision- making and supervisory functions of the Board of Directors from the business execution functions of corporate officers, in addition to granting the Board of Directors an additional role as a discussion forum for the Company’s medium- to long-term business trajectory. Moreover, by delegating broad authority to corporate officers we have reinforced the Company’s proactive management stance. 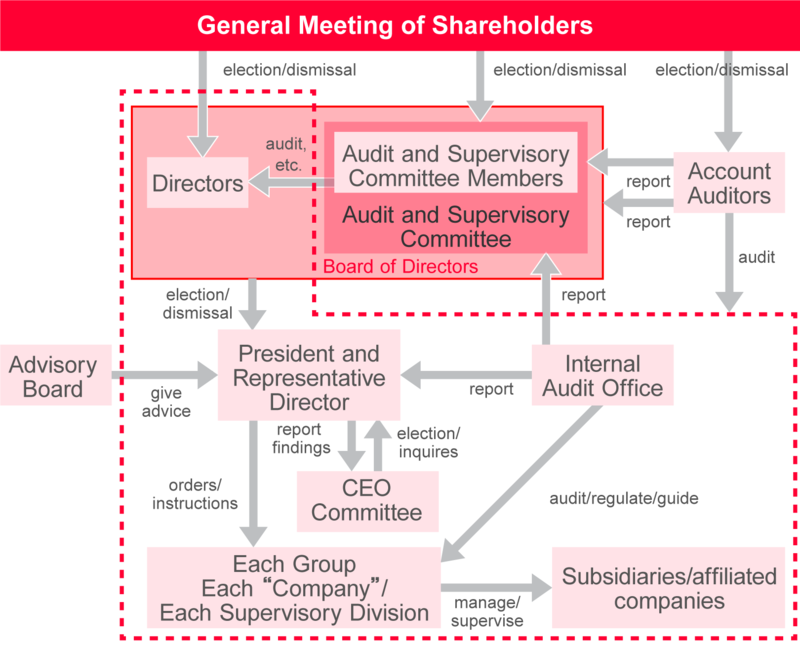 The Board of Directors is responsible for corporate management policies, management strategy, business planning, the acquisition or disposal of important assets, decision-making regarding important organizational or personnel matters, and the supervision of business execution throughout the Yahoo Japan Group. The Company’s corporate governance structure, which clearly separates the decision- making and supervisory functions of the Board of Directors from the business execution functions of corporate officers and autonomous business units within the Company, is designed specifically to promote swift, strategic managerial operations with the goal of enhancing competitiveness. The Audit and Supervisory Committee is composed of three members, two of whom are independent outside directors. The Audit and Supervisory Committee is responsible for auditing and supervising all aspects of the Company’s business activities, including the appropriateness of policy, planning, and procedures; the effectiveness of business implementation; and compliance with laws and regulations, carried out by means of, for example, perusing important documents and inspecting subsidiary companies. Furthermore, the Audit and Supervisory Committee receives reports on auditing methods and results from account auditors and the Internal Audit Office. Based on these activities and reports, the Audit and Supervisory Committee regularly presents opinions to the full-time directors who are not Audit and Supervisory Committee members. In accordance with the Regulation of Remunerations for Directors formulated by the Board of Directors, remuneration of directors and senior management is determined after deliberations by the Remuneration Committee based on the Company’s business performance and respective individual contributions thereto for the fiscal period under review. The Remuneration Committee comprises three persons, namely, the President and Representative Director, Chairman of the Board of Directors, a non-executive director who is not also an independent outside director, and an independent outside director. Important issues requiring deliberation and judgment by the Board of Directors are reviewed in advance by the CEO Committee. Important items related to the Yahoo Japan Corporation and to group companies are reviewed in the CEO Committee based on internal company regulations. Reporting directly to the president, the Internal Audit Office oversees the development and implementation of internal audit systems throughout the Yahoo Japan Group in addition to providing Groupwide systems evaluations and improvement guidance with the goal of ensuring that business operations are appropriate and executed effectively and efficiently. The Internal Audit Office carries out its various audit-related activities in cooperation with audited departments and subsidiaries. When the need for broad-based deliberation arises with regard to issues such as implementing a new business, launching a new service, or other issue of strategic significance, the Company convenes an Advisory Board composed of highly respected outside experts from the academic, legal, and business communities. This enables the Company to incorporate a diverse range of views and opinions into important management decision-making. In addition to formulating business strategies and management plans, the Company’s Board of Directors shall make decisions on important business execution matters. Specifically, M&A and the acquisition or disposal of large amounts of assets shall be deemed matters to be resolved by decision of the Board of Directors, but in the case of other business execution matters responsibility for decisions shall in principle rest with the management team, in accordance with the Regulations of the Board of Directors Meetings. An evaluation undertaken jointly by the outside directors and the Audit and Supervisory Committee concluded that the effectiveness of the Board is generally secured and the overall evaluation score has improved. Although some improvements were seen in Board materials, an issue pointed out in the previous year, it was confirmed that there still remains some issues in information granularity, etc., depending on the agenda. We would like to leverage this result and continue to make improvements. The suitable person for director candidate is nominated and the suitable person for senior management is elected by the Board of Directors. The criteria which are taken into consideration include performance, experience, knowledge, popularity, etc. in Yahoo Japan Corporation or in other companies. If a member of the senior management falls under the reasons for dismissal as prescribed in the internal regulations, the Board of Directors can resolve the dismissal of the senior management member in question. Furthermore, in order to preserve diversity within the Board of Directors, and to prevent membership from gravitating towards all members having similar characteristics, the Board of Directors will solicit opinions from the independent outside directors before making its final decision on the nomination of director candidates. Kentaro Kawabe Since joining the Company in 2000, Mr. Kentaro Kawabe has been serving with distinction for 17 years in important positions of the Company including manager of the Company’s core services such as Yahoo! News and Chief Operating Officer (COO), contributing to the growth of the Company. He was appointed Chief Executive Officer (CEO) in April 2018. He has been appointed as a director so that he can lead the growth of the Company even further. Manabu Miyasaka Since his appointment in 2012, Mr. Manabu Miyasaka has served as President & Representative Director of the Company for six years. Under his strong leadership, he has led the growth of Yahoo Japan Group such as by transforming the Company from a PC company to a company used through smartphones and promoting the “e-commerce revolution”. He has been appointed as a director of the Company so that his valuable advice based on his experience as a leader can be utilized for the management of the Group. Masayoshi Son Mr. Masayoshi Son has a great deal of experience and extensive knowledge as an executive manager. He has been appointed as a director of the Company so that his suggestions and advice as a pioneer can be utilized for the management of the Group. Ken Miyauchi Mr. Ken Miyauchi is the Chief Executive Officer of SoftBank Corp., which is closely involved in the business operations of the Company, and has a wealth of management experience in the mobile phone business. He has given valuable advice about the business operations of the Group since his assumption of office as director of the Company. Therefore, he has been appointed as a director of the Company. Shingo Yoshii Shingo Yoshii has a wealth of knowledge and experience in business management. He has a great deal of insight regarding corporate governance, and has served with distinction for seven years since his assumption of office as an outside auditor of the Company in June 2008 and three years as an outside director (independent director) and full time Audit and Supervisory Committee member since his assumption of office in June 2015. He has been appointed as a director serving on the Audit and Supervisory Committee because he has contributed to the strengthening of corporate governance and to the improvement of the corporate auditing system. Hiromi Onitsuka-Baur Hiromi Onitsuka-Baur has a wealth of knowledge and experience in business management, and has served with distinction for three years since her assumption of office as an outside auditor of the Company in June 2012 and three years as an outside director (independent director) and full time Audit and Supervisory Committee member since her assumption of office in June 2015. She has been appointed as a director of the Company serving on the Audit and Supervisory Committee because she has contributed to the strengthening of corporate governance and to the improvement of the corporate auditing system. Kazuko Kimiwada Kazuko Kimiwada has a record as a certified public accountant and now serves as the Executive Corporate Officer, Head of Accounting Unit of SoftBank Group Corp. the parent company of the Company. She has a wealth of knowledge and experience in the finance and accounting field. Therefore, she has been appointed as a director of the Company serving on the Audit and Supervisory Committee. Based on the Regulation of Remunerations for Directors formulated by the Board of Directors, the Company decides on the remuneration and bonuses of its directors and senior management following deliberations by the Remuneration Committee, which comprises three persons, namely, the President and Representative Director, Chairman of the Board of Directors, a non-executive director who is not also an independent outside director, and an independent outside director, based on each fiscal period’s business performance and each director’s contribution to business performance. *1 The amount of stock options is the cost posted for the fiscal year under review with regard to share subscription rights granted as stock options. *2 For fiscal 2016, outside directors received no remuneration from either SoftBank Group Corp. or any of its consolidated subsidiaries, excluding above. In accordance with the Basic Policy for Internal Control established by the Board of Directors, the Company strives to ensure the appropriateness of all business activities and continuously makes improvements with the goal of creating a more effective system of internal control. One of the key objectives of internal control is to enhance the effectiveness and efficiency of business operations, and the Company therefore prioritizes operational systematization, automation, and integration in support of ongoing improvements. Please refer to our website for detailed information about the Company’s internal control efforts. Yahoo Japan Corporation’s parent company is SoftBank Group Corp., which nominates four of the Company’s directors. While one of the roles of the Board of Directors is to oversee business execution with a view to further enhancing corporate value, with respect to determining specific matters and business execution the Company acts independently based on determinations made by corporate officers. The Company is not overly dependent on either the parent company or any of the other associated companies with respect to sales and marketing transactions. The vast majority of the Company’s business transactions are conducted with individual consumers and companies having no capital-based relationship with the Company. Moreover, the Company’s Regulations for Appropriate Business Transactions and Practices by Yahoo Japan Corporation, its Parent Company, Subsidiaries, and Affiliates prohibit transactions with the parent company and/or other associated companies that give rise to either an unfair advantage or disadvantage with respect to similar transactions with other third parties, as well as transactions that seek to transfer profits, losses, or risk. Based on these and other initiatives, the Company maintains ample business and operational independence from associated companies and endeavors to maintain fair and appropriate transactions. Utilizing a raft of such measures, the Company is judged to be maintaining its independence from the business operations of its parent company to a sufficient degree. The Company makes various efforts to vitalize shareholders meetings and to facilitate shareholders’ exercise of voting rights. For example, the Company has since its founding held its annual general meeting of shareholders on a day when other major companies are not holding meetings. In addition, we promptly post notices of our annual general meeting of shareholders on the Company’s Investor Relations website in both Japanese and English before mailing out notices to all shareholders. Appealingly designed and printed in full color, the notices in addition contain supplementary non-financial information to broaden shareholders’ knowledge of our business operations. Moreover, to ensure that a maximum number of shareholders are able to exercise their voting rights, we permit individual investors to vote online and also offer a dedicated Internet voting platform for institutional investors. The Company’s investor relations (IR) activities aim to provide timely, accurate, and fair information disclosure in accordance with rules prescribed by the Financial Instruments and Exchange Law and the Tokyo Stock Exchange, Inc. In principle, the president is charged with supervising the dialogue with shareholders and other investors, while the chief financial officer (CFO) is responsible for information disclosure. To support the ongoing dialogue with shareholders and other investors, the Company has established an internal IR division. By coordinating with the financial affairs, accounting, and legal affairs divisions as well as with various business divisions to create IR-related documents suitable for release, the IR division helps to ensure constructive dialogue with shareholders and other investors. For securities companies and investors, Yahoo Japan Corporation holds Investors Meetings, in which details of financial statements and business activities are explained. Leveraging live streaming, on-demand videos and teleconference systems, etc., we proactively share information about our business. Individual interviews and teleconferences are also held for securities companies and institutional investors, in which the President and Representative Director or other management staff speak proactively about the growth strategies and share operational information about the Yahoo Japan Group. For IR targeting foreign investors, Yahoo Japan Corporation creates the majority of the above disclosure publications in English. In addition, we visit our overseas investors hosting “Overseas Roadshows”, primarily in North America, the UK, and Asia, in which we gain the opportunity to directly engage in dialogues with our foreign investors. In regards to IR publications, from immediately after our initial public offering in 1997, we have continued to publish a detailed overview of our financial and business operations as a quarterly financial report to ensure timely disclosure. In addition, along with these reports, we summarize and disclose information on potential risks to the Company. Current publications, as well as an archive of all past ones, are published on the Company website. Opinions and proposals from shareholders and investors comprehended through dialogues with them are summarized in a report and submitted to the directors, management staff and related internal divisions as feedback, or, in urgent cases, are communicated to the related parties immediately. In keeping with the company’s “Regulations on the Prevention of Insider Trading”, material facts which have not yet been officially announced are thoroughly managed and appropriately handled. Regarding information on our business results, in order to prevent leaks in information and - 6 - preserve impartiality, we have instated a quiet period. During this period, company representatives will refrain from answering any questions or providing any comments related to the business results. A small group of major shareholders account for a significant portion of the Company’s ownership. Because the risk of a hostile takeover bid is considered to be low, the Company has not formulated takeover-related measures. Recognizing this matter as a potentially significant management issue, however, the Company intends to consider the necessity for and content of effective measures.